Are you attending the NGS Family History Conference next week? I am excited to be there in person, but I always miss some excellent sessions because I can only be in one place at a time. Are you unable to attend the NGS conference in Florida? Would you like to hear some of the conference sessions from home? Well, here are your options. There is still time to sign up to watch the live-streaming of ten of the sessions on Thursday and Friday, May 5th and 6th. If watching live does not fit into your schedule, you will have three months to watch the sessions at your convenience. Here is the link to register. 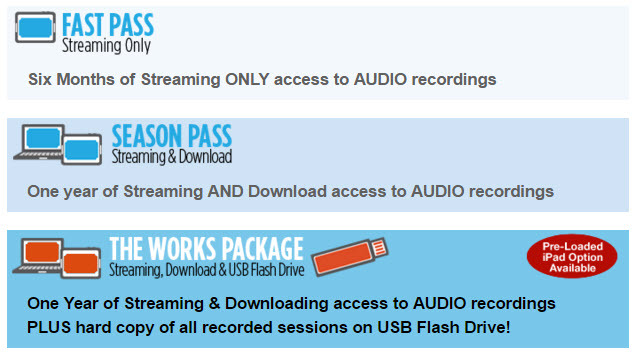 You can purchase a pass which will include audio recordings of ALL 140 sessions of the conference! See the three package options in below, and click here to order online from PlayBack. This is a great deal, and if you act fast you can save $100 on the package by ordering before May 7th. After that date the prices go up. If you just have a few sessions you are interested in, you can order them individually for $10 each. Click here to see a listing of all of the sessions by topic or presenter. I have ordered individual recordings of my favorite sessions for each of the last eight years. It is a great way to hear some of the best presenters in genealogy while you drive to work or take your daily walk. I hope you enjoy these options for continuing your genealogy education! Have you been thinking of joining a ProGen Study Group to work through the manual Professional Genealogy with other genealogists? Do you have a friend that you would recommend for the course? There is an unusual opportunity right now to skip the waiting list and join a study group starting June 1st. If you feel you have the time and the experience requisite for the challenge of the ProGen Study Program, please see our website for details and then submit your application to the waiting list at http://progenstudy.org/. If these do not work for you, then you can join the waiting list and hold off for the next study group to form in October.